Please click here to return to comment 9 of the main paper. This text consists of four parts. The first, discusses private players, their vulnerabilities and weaknesses. We have a sub-section on the role of the US housing market on the crash, as this exemplifies many of the broader temptations and weaknesses. We then look at the tottering imbalances of the current situation. The third section is concerned with regulation. Finally, we ask what a solution might look like. The chart gives some sense of the scale at which this sector has grown. Note the logarithmic scale: 1010 is a number ten with ten noughts after it. To connect savers to projects. To allow organisations to hedge against various forms of uncertainty and volatility, build portfolios of assets to meet specific needs and in other ways meet real-world needs in fluctuating circumstances. Retail banks also serve their customers by safely storing money, transferring it and performing the tasks with which we are all familiar. In doing this, they make a modest return. In addition, however, the current system opens a vista on an almost endless spectrum of speculation. The asset value of the stocks traded through the world's bourses in 2008, just before the crash, was USD 36.6 trillion, or comparable in scale to gross world product. It is thought that at most 10% of global privately owned assets - rice paddy, banana trucks, houses - is traded on bourses, making gross product something like 10% of fixed assets, a credible number. In the same year, the world's derivative market was $791 trillion on 'mark to model' value. Mark to model is the fantasy face of accounting. The other, more usual face is called mark to market, which asserts that what a thing is worth is the price for which it will sell - a state bond, for example. What "mark to model" means is that nobody expects to realise the face value of these instruments and that they exist, so to speak, in counterpart to a mirror image, second instrument or group of instruments that cancel all but the most marginal exposure to these armies of paper trillions. Cancel they do, except when the music stops. A great deal of this activity is own-account trading, that is, using other peoples' money in speculative trading. This has been found to be vastly profitable as compared to fulfilling the so-called "social functions" mentioned above. But speculation is a zero sum game. Every winner is matched by one or more losers. Who was losing? Research suggests that there are three classes of loser. Major clients are paying huge fees to use sophisticated instruments that they did not need. Major savings aggregates - pension funds - are being charged perhaps 2% of gross earnings per annum due through fees generated by asset churning. Third, the banks themselves were losing money to each other. One particularly pernicious instrument has been the CDO, or collateralized debt obligation. These were invented by the now-defunct Drexel Burnham Lambert Inc in 1987, but they had a slow start. CDOs are an example of a wider field of asset-backed synthetic securities: that is, assets that represent some process of combining and sorting the qualities inherent in some free standing assets - housing, corporate bonds - into tranches, the owners of which are exposed to different levels of risk. The originator parcels these assets into new securities which they have created, each of which have different rights to different tranches of the total cash flow. That is to say, one tranche might have rights to the first $50mln of cash flow from the asset, and Tranche 2 might have rights up to $50 mln as to what is left over after that has been taken. The first tranche is therefore every safe, and can be rated at AAA, whilst a low ranking tranche is highly exposed to cash flow short-falls, and is therefore rated as risky. The bank takes a fee for carrying out this service, and sells on the tranches as risk-rated securities. Risky tranches are sold at discounted prices, representing a high rate of return on the possible cash flow from them. They are bought by risk-focused entities such as hedge funds. So much, so broadly sensible. However, a German insurance company that has bought a AAA-rated bond knows nothing about the conditions in, for example, the Los Angeles housing market but is now exposed if there is a debacle in it. CDOs are based on real assets, of course, and one element that crept into the CDO framework were the US sub-prime mortgages. This component then permeated the system, so that everybody had some of it but none of it was visible as an actual agreement. That would not have mattered if the US housing market had not been so thoroughly mis-managed. The US housing market stood at about $12 trillion in 2009. Two so-called Government sponsored entities (GSEs) handled about half of this. These were the Federal National Mortgage Association (Fannie Mae) and the Federal Home Loan Mortgage Corporation (Freddie Mac). These collapsed in September 2008. The US Government was forced into a vast rescue package which the Treasury now (2012) estimates will have cost in the order of $1.1 trillion. These entities were born of muddle, in the sense that they were privately owned but at least partially tasked by government. In particular, they were under constant pressure both to be profitable, but also to keep mortgages rates low. Additionally, they were required to lend to meet mandated affordable housing goals, as specified in the 1992 Federal Housing Enterprises Financial Safety and Soundness Act. In attempting to meet both these goals, "mission creep" set in. This expansion proved unsustainable. It is estimated that around half of the lending in the latter years went to consumption by clients who never intended to repay the loan. However, by this time property-backed securities had been sold that now permeated the global market, as already discussed. In addition, the shareholders in the two GSEs saw enormous losses as the share price collapsed. The US government saw its role in stabilising the exposure of the Chinese and other foreign governments, which collectively held $5.4 trillion of at-risk securities. The other losses fell onto the banking system, which - not knowing who had lost what, for reasons already discussed - froze. There are two clear points to take from this. First and foremost, management had lost all prudence. Plainly, as the credit crunch then showed, management had the least vestige of an idea as to what risk they ran or what assets they actually held. Why they allowed this to happen is something that we will get to in a moment. Second, the checks and balances in the system - from regulators to ratings agencies - failed in their tasks. They did so in different ways in different places: political interference in some, simple bafflement as to what was going on, weak or slow reporting and poor statistics all had a role to play. However, if management themselves had not idea as to what was happening, it is somewhat hard to blame regulators who relied in turn on management reporting. (That is not, however an excuse when the issue is one of sovereign debt.) What also failed, and this is perhaps a stronger signal, were the basic market mechanisms that should have raised hairs on necks, had specialised academics clearing their throats and journalists trumpeting warnings. Instead, there was silence up to the precipice itself. As a specific example, the regulatory body which oversaw the Fannie Mae and Freddie Mac agencies, OFHEO, had reported widespread accounting fraud at Fannie Mae in 2004. It transpired that Fannie managers' bonuses were tied to earnings. As earnings started to fall in the early 2000s the managers' manipulated Fannie's financial records. Whilst admonitions flew to and fro, nothing substantive was done by OFHEO. President Bush only abolished the OFHEO in 2008, after the collapse. Why did the entire structure appear to lose its sense of reality? First, information is obscured by propaganda or is simply missing, or missed. The 1987 Asian crash had the state accounts of major players adrift by an order of magnitude in regard to their exposure to foreign debt. Information is missed when people lack a "thinking model" that calls for wider inputs and longer time frames. By contrast, business and state cultures that work through parochial and unchanging models to ambitious targets will almost never recognise warning signs, and may deny these and decry those who deliver them. The second element is even less creditable. People may be aware that the bubble cannot continue to swell. But if it pops in a month's time, money can be made from speculation today, using other peoples' money. It is, after all, the investor and not the trader who will lose when it pops. It is fashionable to blame high bonuses for this mind set. Certainly, the rigging of LIBOR and of the Fannie Mae accounts were down to simple peculation. It is not at all clear why banking does indeed tend to pay high performance bonuses. There is little evidence that it creates proportionate performance; and there is much evidence that good performance comes from a team effort, or, less creditably, as the result of a protracted random walk. What intense and competitive individual ranking does do, however, is to attract a particular kind of person, for whom winning is everything and for whom the voice of caution is a betrayal. These individuals love stress and tend generate it in the workplace, forcing out all but like-minded individuals. In effect, such a team expels of crushes the quiet voices of reason. This middle management culture is rife in the trading aspects of the financial world, and it has features almost guaranteed to generate bubble-supporting behaviour: the hunting-band ethos, all glory to today's victor, the demand for unthinking commitment to the values of the group. Few of these people get into senior management, generating two distinct cultures in an organisation. The mild corporate manager then faces what is in effect an out-of-control band of desk warriors whenever they want to ask what is going on. The graphic which is shown below was prepared in 2009. 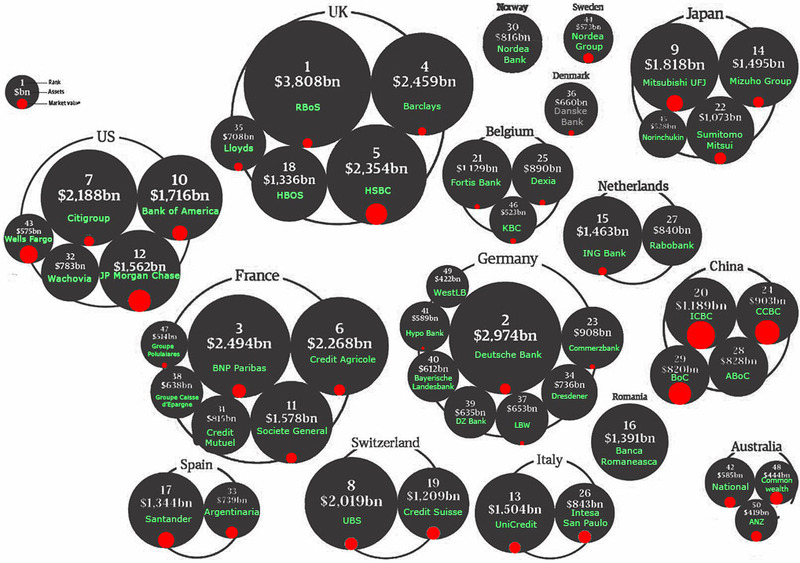 The banks' the balancing assets and liabilities are shown as the black disks. Recall that these exactly offset each other when all is well, and the bank makes money from marginal difference between them. The bank's underlying capitalisation is shown as a red circle. The ratio of the two shows the degree to which the bank has parlayed up its underlying assets into a balloon of trades. It will, of course, only have to realise the margin on those trades under normal conditions. However, if this careful balance of assets and liabilities were to be weakened by, for example, a default, than it would need to be realised from the red circle. The relative sizes of thee two in RBoS, for example, was clearly disproportionate when these data were collected. A small fraction of the black circle would have to be compromised to swamp the red. In these terms, the top five banks in the US have roughly $7 trillion in such 'assets'. By contrast, the top five banks in France have nearly $1 trillion more in play than the US banks, and these were clearly even more under-capitalised. Similar things are true of the banks of the UK, Germany, Spain, Italy, Belgium, and the Netherlands. The 'assets' of each of these are the liabilities of others, with the net worth being the value of the black dots. Marking to market means accounting the assets of the banks entirely in "red dot" terms, which is to say that tens of trillions of "assets" simply vanish. This is not something which any conceivable state bail out can manage. World product is something around USD 50 trillion, which grows at about 3.5% per annum. Suppose that the entire European asset base was market to market in this way: about USD30 trn evaporates. It took the world around 15 years to generate that amount, so a crash of this sort would notionally return us to the environment the 1990s; but with a much stronger effect on the developed world than the emerging economies. 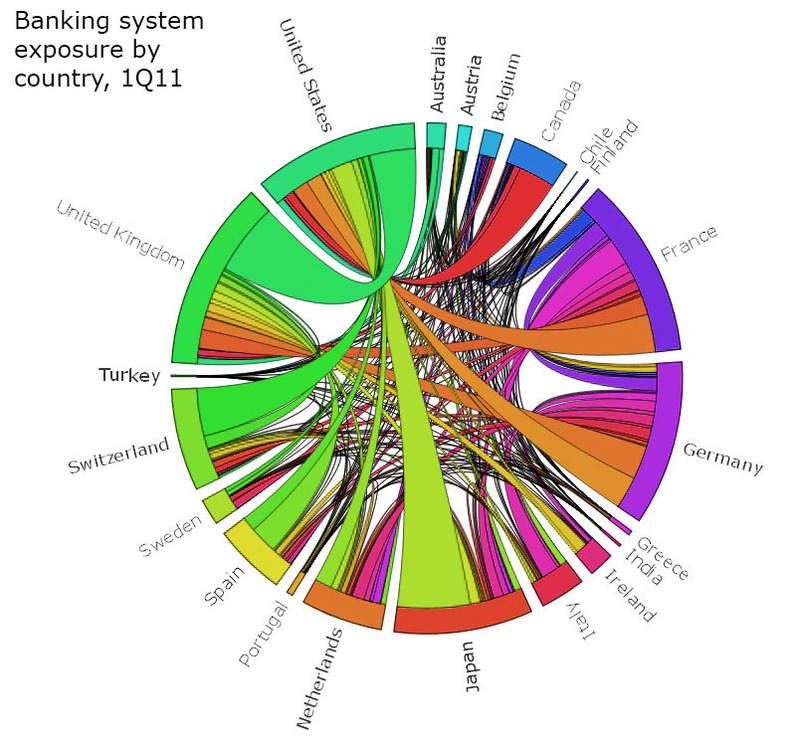 The chart that is shown above represents assets held across borders by the various major countries, together representing 80% of all such international holdings. It reinforces the scale of current inter connectedness. This has grown from extremely modest origins in, perhaps, forty years, before which such transactions related entirely to trade. We come to the heart of the issue when we ask: how can this sprawling, secretive, bubble-prone and often obscurantist set of structures be stabilised? What we want is not the stabilisation of the tomb, a freezing up of initiative, but a clear relatedness between what these institutions do and their 'social purpose'. That purpose in any rational structure, is of course to make money for their shareholders but also - primarily -to serve as the gears of a central engine of the global economy, an engine that must not again be allowed to falter. What needs to happen? The enemy of the bubble is supposed to be information. However, we are remarkably adept to closing our ears to information that we do not want to hear. Some readers may recall solemn papers on how "internet economics" was somehow different, and that the dot com bubble was no bubble, but a response to a 'social phase change'. Investors' meetings did not at all welcome remarks to the effect that a business plan with no cash stream was no business plan. In other words, whilst no information or false information is plainly bad, the sole existence of information is not of itself a panacea. It takes very much more than mere "transparency" to break a trend, notably so if that trend is both what people want to hear, and something which it is immediately rewarding to follow, at least in the short term. The obvious tool kit to manage bubbles is the existing regulatory system. It has not, however, shown itself particularly good at detecting bubbles, even when they are fully grown. An alternative notion is that "bubble proofing" can somehow be built into market mechanisms, elements such as Tobin taxes that (may) discourage churning. 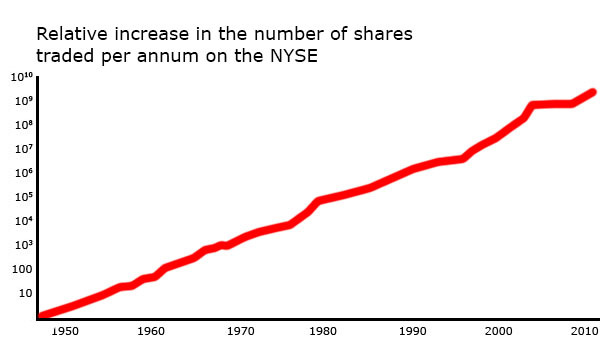 There are many recommendations of this sort that have been made – that we should have smaller banks, less universal banks, banks that have to carry more capital reserves, banks with weaker incentive systems, or with stronger incentive systems, in the sense of granting more shareholder power and placing a threat of no bail outs for shareholders if they do not exercise that power. The list of proposals is extremely long, and not particularly persuasive. In essence, all of these mechanisms try to connect today's motives with tomorrow's outcome which, as this is the prime purpose of financial markets in the first place, does not seem likely to succeed. We must therefore discount this second mechanism, leaving plain old regulation. There are a considerable number of financial regulators in most countries. US banks, for example, have five agencies supervising them at the national level – the Federal Reserve, and the less known Office of Thrift Supervision, The Office of the Comptroller of the Currency, The Federal Deposit Insurance Corporation and the National credit Union Association. Each state also has a separate banking regulator, and also has a separate one to look at insurance companies. Commodities, futures and securities attract a further seven regulators, such as the Security and Exchange Commission, plus the individual state regulators which shadow it. Other nations have similar more or less elaborate structures. In other words, there is no shortage of regulation, merely a paucity of effective regulation. International economic regulation is, once again, provided with an elaborate web of agencies. States publish national accounts, which are back-stopped and checked by the IMF and, in the case of the smaller economies, also the World Bank. The BIS acts as a clearing house of central bankers, and (many) organisations such as the OECD, G-groups and others, plus NGOs think tanks, financial journalists and academics all add their views. Dozens of trade bodies also exist, representing bankers, insurers, commodity traders and the like. Tens of thousands of pages of print emerge every month assessing all aspects of the world economy. There is, therefore, hardly a shortage of analysis or of general information. What is lacking is, however, a convincing synopsis, a way of grasping the complex, slippery, uncertain tangle that is the world system. What is also lacking are non-generic data, of who has what and owes what to whom. Better reporting of the data must help. National accounts lag events. Banks are obscurantist, to be polite, in what they publish or reveal to regulators. That said, reporting is not enough. Data are unhelpful unless they inform a way of thinking, a synopsis of events. Some of the graphics in this article are examples of early steps to grasp this issue. The figure shown below is, for example, a day-by-day plot which is based on calculated risk aversion (high, in red; low shown in green) displayed in a range of markets, from 2008 to the end of 2010. The development of the Euro and G10 sovereign debt crisis is clearly visible. We take in patterns with our eyes that our other senses do not detect. Streams of numbers are those most difficult of all from which to extract overalls sense. The problem with visualisation tools - wonderful aids though they are – is that they show us what has happened, not what is going to happen. There is truly only one tool that can do that, and this is the application of human understanding to the issues over a long period, free from peer pressure and from the need to please others. The issues are too complex for single academics or small groups: they need significant teams, supported by full data access. Paradoxically, such teams exist, but are dedicated to making money in the bond market and not to managing the system. Indeed, any such group, if connected to regulatory measures that would have international weight, would then be in the position to make major fortunes for themselves if they were to act corruptly. Perish the thought! Central banks, pretty much everywhere in the industrial world, have gained considerable independence in the past thirty years. Inflation control is now seen as a mechanistic business that is based on considerations of money supply, capacity utilisation, world conditions and other measurable quantities. It is considered good that the reaction to these forces should be decoupled from political interference, not least as deflationary policies are politically painful and politicians are over-keen to spend. In practice, central banks may manage interest rates but it is the politicians who control money supply, taxes and most of what truly matters in the economy. However, we have to ask whether this model can be extended - to cover other issues - and expanded, to address international finance? Is there a technocratic - or technological - answer to this? As has already been discussed, any regulation of the financial structure of a country - let alone the world - is an innately political activity. When there is a simple measure – such as inflation control – this can, to some extent, be delegated in a convincing manner. A fully integrated financial management system that is run on technocratic lines – much as is being proposed for the Euro-zone at present – is politically unthinkable. No US President would put the economy under the control of a consortium of international bankers and regulators. Nor, probably, would any German Chancellor or Japanese prime minister; let alone any Chinese politburo. Such relations will always be at most advisory. The values that are inherent in the current system - primarily, that of directing resources to where they can be best used to economic ends - could as easily be rephrased to "redirection to where they can be best used socially", a redefinition that would be supported by a huge majority of the world's voters. It is always fun to spend other peoples' money. Knowing this, few major economies would commit themselves to a system that could be so redirected. Politicians are themselves extremely prone to bubbles. Even hard-headed individuals such as Margaret Thatcher succumbed to a triumphalism when British growth temporarily surpassed that of Germany. Bush was convinced that deficit spending would generate returns – or that tax cuts would do so – and the current Republican team seem to think the same. The impact of the Fanny/Freddie debacle was particularly intense because Bush had converted an annual US surplus of $800 bn to an annual deficit of around $670 bn through tax cuts and military spending. Left-thinking politicians tend to believe that state spending will give greater returns (in taxes and growth) than allowing the same money to be spent through the private sector. Many in Europe believe that "austerity" is decreasing state income faster than it is cutting state spending, and in some cases they may well be right. That does not mean that the opposite is true – that extended state spending will increase state income at an even faster rate. That is, however, a thought which it is not convenient to think in Left-leaning circles. This brings us back to the need to be able to visualise this vastly complex terrain. What is lacking is common sense management. Why? Because nobody has the perspective to deliver this. "There is nothing so uncommon as common sense. One must labour over years to obtain it, and one never knows when one has it." That said, when it is plain how the troops are disposed and the terrain laid out, even the most wishful general cannot wish brigades across rivers and starving armies fed. In the absence of such a synopsis, everything is the fog of war, with 'ignorant armies that clash by night'. We have the technology to deliver this requirement. We may even have the will to do so, if banks and other players can be forced to make the necessary, anonymised disclosures to such a system; if states are able to keep their statistics current and if the interpretative analysis is good enough. However, given that we had such a god-like perspective, would it follow that bubbles were a thing of the past? Probably not: market runs might well be considerably lessened, but the sort of boom that would follow on from – for example – the announcement of cheap nuclear fusion would certainly be as unrealistic and as euphoric as that of the dot com years. It is part of the human condition to revert to hopeful childhood on occasions, awaiting a magical Christmas.